As Hippocrates (the Father of Medicine) rightly shared, “Natural forces within us are the true healers of disease”. Our bodies have the ability to detoxify themselves however the body can become overwhelmed due to the volume of toxins exposed in its environment by way of water (fluoride and other chemicals), air (chem trails, pollution and other toxins), food ( chemicals, pesticides, preservatives, genetically modified ingredients etc), pharmaceuticals and other drugs. True healing requires a detoxification of both the mind and the body. The ancient Greeks always advocated that it was important to “think good thoughts” – Oracle of Delphi and to “let medicine be thy food and food thy medicine” – Hippocrates. 1. Start the day with a glass of spring water and the juice of one freshly squeezed lemon. This helps flush out the toxins and restart the body. It also helps alkalize the body and the vitamin C has anti-cancerous properties. Alternatively you can add a couple of tablespoons of apple cider vinegar to a glass of spring water. Hippocrates treated his patients with apple cider vinegar. He found it was a powerful cleansing and healing elixir, “a naturally occurring antibiotic and antiseptic that fights germs and bacteria” for a healthier, stronger, longer life. 2. Drink a freshly-made vegetable juice daily. Include lots of greens such as kale, spinach and coriander. I love to start my day with a juice made with apples, carrot, lemon, ginger, turmeric, beetroot, kale and coriander. When the seasons change then some of my ingredients will also change. Turmeric contains the phytonutrient curcumin that is one of the most powerful liver protectors and healers. The liver is largely responsible for detoxification. Organic apples are pectin-rich. The pectin binds to toxins in the intestines to carry them out of the body. As the saying goes “an apple a day keeps the doctor away”. 3. Eliminate toxic oils out of your diet such as vegetable oil, peanut oil, sunflower oil, cotton seed oil and canola oil and substitute with good oils such as extra virgin olive oil, coconut oil, avocado oil, hemp oil and flaxseed oil. For example hemp oil is also a good source of omega 3, 6, and 9. 4. Drink green tea and herbal teas such as dandelion, nettles etc. These teas help the body detoxify and clear out toxins. 5. Eat more raw fruits, herbs and vegetables. Fruit, vegetables and herbs contain enzymes that aid digestion and improve nutrient absorption. 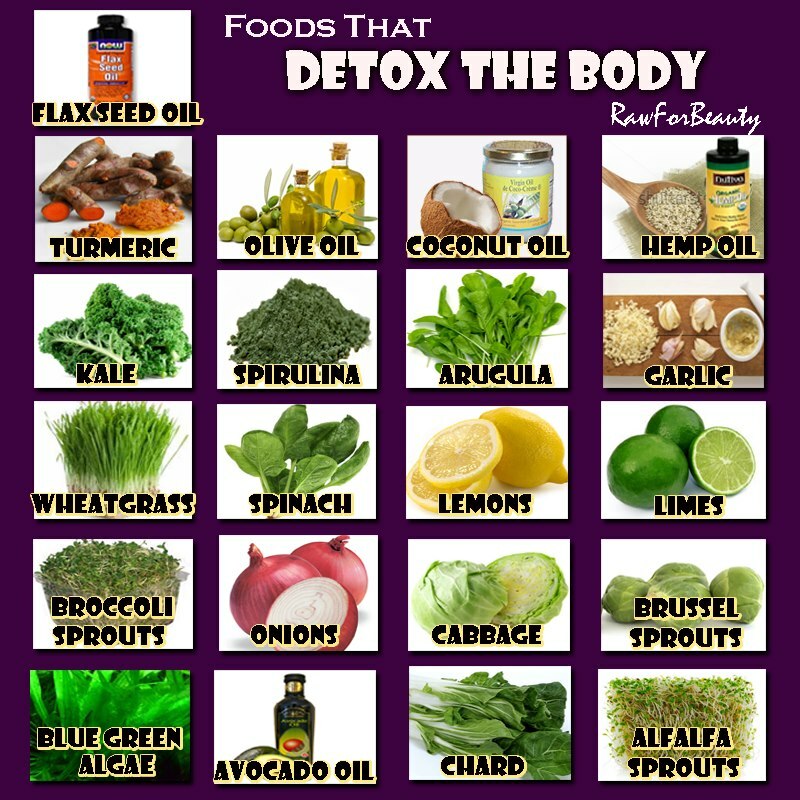 Many nutrients are needed for efficient detoxification if the body that are contained in fruit, vegetables and herbs. 6. Minimise or eliminate white sugar intake and substitutes that contain toxic aspartame etc for other natural sweeteners such as stevia, honey, coconut sugar, date sugar, molasses, or maple syrup. Various studies including one published in the Journal of the American Medical Association (JAMA) it has been shown that people who ate the largest amounts of added sugar had the highest blood triglyceride levels and the lowest HDL (good) cholesterol levels. That study also showed that eating lots of sugar more than tripled the odds of having low HDL cholesterol levels, a strong risk factor for heart disease. 7. Minimise or eliminate white flour and white breads. White flour is like adding glue in the body and it overworks the digestive system that is trying very hard to clear it out of the body. It can cause digestive disorders and it can make it difficult to have a normal bowel movement. 8. Take a probiotic supplement with live cultures such as cultured vegetables, Greek yoghurt, kefir etc. The beneficial bacteria kill harmful bacteria and yeasts and help to heal the lining of the intestines. 10. Breath deeply, walk, smile, laugh, be happy and remove toxic people out of your life. Find the positive in every day and move your body. This will all help to reduce stress and the stress chemicals in your body. unfortunately its not as healthy as some sources claim. Also opt for other healthy oils such as extra virgin olive oil.